Most people are familiar with The Philadelphia Art Museum from watching Rocky Balboa run up the front steps. Lots of steps, big columns, stately but plain. It’s a shame there aren’t steps under the North Pediment because that one’s cool . But I suppose that would detract from Rocky. theme of sacred and profane love in Western civilization. The central figure is Zeus, ruler of the gods. He stands holding a sphere in his right hand and a scepter in his left hand. protector of marriage, holding the hand of the child Triptolemus whom she rescued from a mortal illness. To Zeus’ right is Aphrodite, goddess of love, plus Hippomenes in the form of a lion. Further to Zeus’ left is Ariadne, then Theseus slaying the Minotaur, and the beast Python. 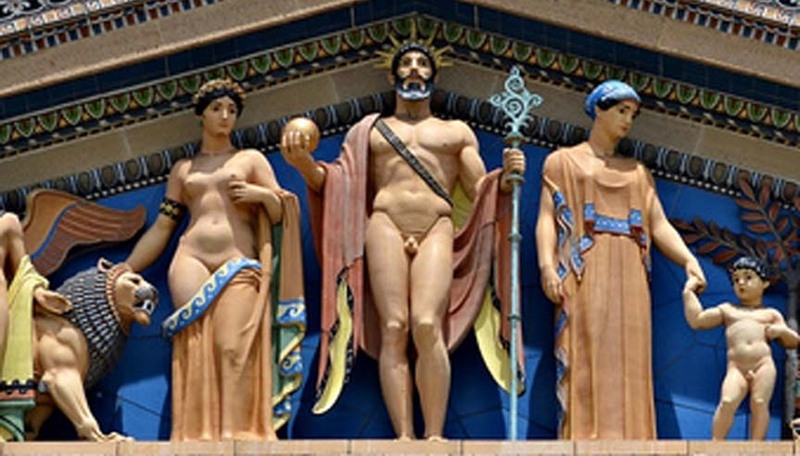 Further to Zeus’ right are Aphrodite’s son Eros, Adonis, Nous (the mind), and Eos, goddess of the dawn. Eos is turning away from the owl, bird of the night.